The drawing below illustrates the recommended design for handrail fabrications. The bullet numbers correspond with number references on the illustration .Internal holes should be the full internal diameter (ID) of the pipe for the best galvanizing quality and lowest galvanizing cost.Vent holes in end sections or in similar sections must be 1/2" (13 mm) in diameter. 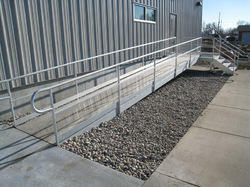 Owing to devoted experts, we have been competent to present a wide range of MS Railing. These products are made as per industry norms and standards. We are included in offering amazing Home MS Railing to our important clients. These items are produced using top notch parts. We are one of the best organizations in the market for offering a wide collection of MS Railing to the customers with the strongly support of our professionals. Leveraging on our enormous business competency and huge info of this field, we have brought forth a vast gamut of MS Railing.